Understood. I think I can squeeze the busy dialog in there somewhere. That's why Embuary is the skin to use It shows a nice loading circle in the corner, thanks to sualfred. Are you talking about the green K top-right or the spinner top-left? If the latter, I only see that when the emby-loading video comes up. The green K only when updates are happening and not for playback. In stable, I see the green spinner right on the poster itself or from other playback view (ie; currently watching) center of screen. Yes that's what I'm referring to. This way you know it's not frozen? yeah I only see that when the emby-loading video shows but the "pause" is definitely a second/second-and-a-half before I see that. With stable, I saw the spinner on the poster/center of screen and then playback; gives the user the impression something is happening. I know, I know... it's a first-world problem where that sort of timing is something to complain about Always appreciate the work/help you give, just wanted to make sure that's said--don't want to seem ungrateful. EDIT: Maybe add a third option, ie: Emby-Loading, Blank or a static image w/loading on it? EDIT: A static image may be more suitable to low-powered devices; betting if I tossed Kodi on my laptop it wouldn't seem like a delay at all but entirely different beast. Although it's "unsupported"; my Android TV boxes have CE written directly to the internal flash (vs external USB/SDCARD as per recommendation) which is fast enough (for DB transactions, loading images, etc) but not the fastest and probably contributes to the delay perception. Images load faster than videos off the medium in this use-case. Just a rambling train of thought with my morning coffee while I wait for the repair to finish. Edited by flatline69, 23 February 2019 - 10:58 AM. Ah yes I see what you mean. That I cannot fix. Do try to repair your library to rule out some weird Kodi interference with the first resume dialog or something. What is your default play action again? "The 6th Day" is my go-to test video. Last log I tested a few random titles, such as the one the above sample. Some formats do take longer to start playback than others, so I concede that in my testing. I hope I understood the question when you asked 'default play action'. Do you happen to know what kind of box the other tester is using? Mine's a AMLogic S905D -- if the tester is using a S912 (for example) it'd be faster h/w than mine is whereas my S905D is faster than my other S905 boxes. What I showed you happens before the emby-loading video is returned to Kodi. This has nothing to do with the video itself, just somewhere Kodi has that delay between the HEAD request and the GET request. Could be just a slower device. But let's revisit once repair is completed. No I do not know his device, I will find out next time. The default action, like play or resume or show information or choose. In the Kodi settings > media settings. How would that work exactly? So let's say, you start playback, Kodi calls the add-on, the add-on returns the image. Won't Kodi skip to the next video? Right now, Kodi calls the add-on, we return emby-loading which is paused. Meanwhile, the actual playlist is being setup. Once it is, it plays it. The pause is important since it allows us to create the actual playlist and add it for playback. Edited by Angelblue05, 23 February 2019 - 11:13 AM. Library is repaired, resume still does the same thing; two prompts. First is proper resume timestamp, second is -1 day, 23:59:59 and then skip ahead (now) to 2 titles from selected. Attaching log, you'll see the repair happening so scroll down a bit to see the test after the repair. 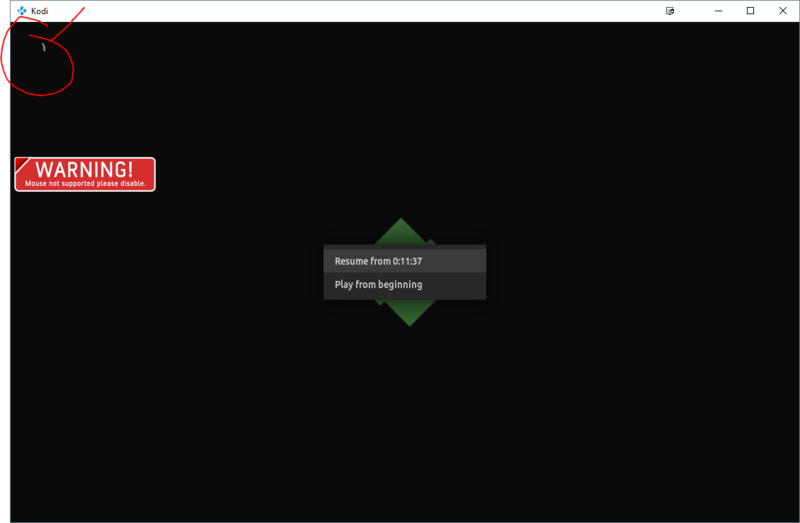 Restart Kodi, I see the playback stop happening again. Let me know if that skip ahead still happens after you restart? Strange the repair didn't work. That's what others who had that issue said worked. For now, just go ahead and change the default play action to resume to get rid of that double prompt. Edited by Angelblue05, 23 February 2019 - 11:28 AM. OK will do. Just a quick update - out of curiosity, I tried the context menu "Play" and "Play from here" -- the first gave a resume prompt and returned to movie hub. Second gave resume prompt and picked up from where it left off. Also, was this after restarting Kodi? Please provide your log to go with your testing. It's the only way I can troubleshoot this. Sorry. Edited by Angelblue05, 23 February 2019 - 11:32 AM. And stuff without a resume point? Same thing? I don't understand why it stops again. That wasn't part of your log you showed me when you updated CE. <-- This is causing all the havoc with the skipping. Drastic measure. Can you send me your MyVideosxx.db database. You can pull it off using the backup option in the add-on settings... or whatever suits you. Something is also wrong with detecting the position tick. I'm not sure if it's a side effect of the skipping. You have sometimes, current position -1000000. Edited by Angelblue05, 23 February 2019 - 11:48 AM. I will try something different in the playlist manipulation, since apparently CE needs to stop playback for some reason. I've only seen this on CE. Unwatched titles (no resume) skip one ahead I even made sure to reboot after sending you the DB file. EDIT: Since I've been going back and forth between beta/stable should I maybe wipe everything out Emby-wise and rebuild and re-test? It takes about an hour for me (large libraries) but might be worth a shot? Edited by flatline69, 23 February 2019 - 12:07 PM. I don't think it will help. There's no real difference between stable and beta except for what we return when Kodi calls the add-on. Unless you think that would explain why the stop is happening again? In your log after updating CE, no stop. Now, it stops every time, which skips ahead one title. If you do go ahead, make sure you do a local database reset to ensure it wipes the database clean. Edited by Angelblue05, 23 February 2019 - 12:11 PM. Can you try this build? I don't know if it will fix the situation, but do show me a new log. Thank you again for helping test beta. Attached. Tried my usual go-to title w/resume and other titles that I hadn't watched before. Rebooted and tested same way again. Only saw once (before reboot) where the title played as expected; after reboot a skip. Further testing led to delays in playback where I'd see a spinner endlessly. In some cases, I'd see the resume/start-over dialog before the emby-loading video.